You are invited to participate in a survey that forms part of a research project investigating the training needs of current and potential KB+ users. The research is being conducted by Jo Alcock Consulting on behalf of the KB+ team. The survey asks about your training needs as well as asking for feedback on current training materials. The full survey should take no more than 10-15 minutes of your time. The survey is available at https://www.surveymonkey.co.uk/r/kbplustraining and will remain open until Friday 10th February. New for this year are our KB+ One Day Workshops. We ran 2 last month in London; full details on upcoming workshops & booking form are available on our events page. During the day we provide demonstrations of key features of KB+ followed by a set of exercises with copies of relevant user guides. Examples of the type of exercise include setting up a subscription, exporting a licence etc. We are keen to ensure participants have valuable practical hands on experience of the system to help gain a better understanding of KB+ and its potential. The exercises also provide the perfect opportunity for the data mangers to chat to participants, answer questions and see how KB+ is being used. In the morning we focus on the role KB+ plays in recording, managing and tracking licences and in the afternoon we look at creating subscriptions, the renewal process and compare packages tool. Each workshop begins with introductions allowing the participants to say what they want from the day to ensure we cover the relevant information. We also have guest speakers at the workshops. At the first workshop we had a talk from Robbie Ireland about the SafeNet project, “SafeNet is a shared post-cancellation access (PCA) service for UK academic libraries that builds a UK archive collection and clarifies entitlement rights”. It was encouraging to hear they plan to use KB+ as one of the authoritative data sets. At the second workshop Ben Taplin, Licensing Specialist from Jisc, gave an introduction to ONIX-PL licences. I was interested to see how in picking out the key terms from the dense licence text helped improve the clarity of the key properties within the licence and how it also provided the opportunity to compare licences. It was a useful introduction to demonstrating the licence comparison tool in KB+. I have really enjoyed the workshops, its been great to meet people, chat about e-resources and share experiences. Initial feedback from those who attended has been also been positive. 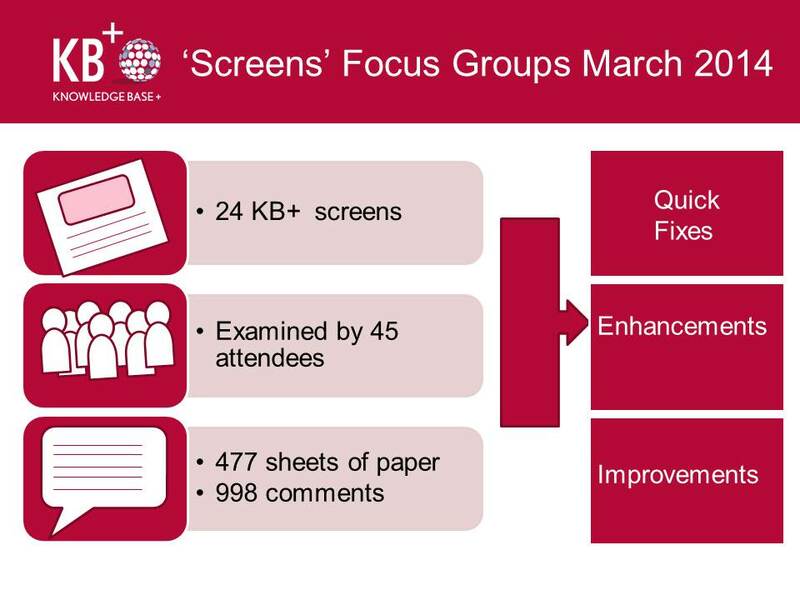 Hopefully having the time away from work, the opportunity to focus on KB+, meet other institutions using KB+ and support from the data managers on hand provides the right environment to explore the benefits KB+ can provide in managing e-resources. So if you use KB+, are new to it or just interested to find out more then why not sign up to one of our workshops or webinars on our events page. You can now easily track which new packages are added to KB+ either by email alerts or RSS feed. Each time a new package is added, details are posted to a KB+ discussion forum at https://kbplus.zendesk.com/entries/26892807-Changes-related-to-kbplus. You will then see a list of the new packages added and the date. To subscribe by email you need a login for the KB+ Discussion boards, details on how to register are available at https://knowledgebaseplus.wordpress.com/kb-support/basics-and-first-time-setup/creating-a-zendesk-login/. Once you have logged in, go back to the forum at https://kbplus.zendesk.com/entries/26892807-Changes-related-to-kbplus and you will see a ‘Subscribe’ icon (an envelope) at the top right of the forum display. Click on this to get email updates. To subscribe using an RSS feed, use the following URL https://kbplus.zendesk.com/entries/26892807-Changes-related-to-kbplus.rss. No login is required to access the RSS feed. At UEA we’re still KB+ novices, but we thought we’d share some of the KB+ workflows which we think will be relevant to our institution. Workflow 1: Creating and recording subscriptions for all our nesli2 and related deals. This can be done for existing and past years and includes adding titles (entitlements) and editing issue entitlement dates manually where necessary. This gives us an accurate online record of our key packages and their holdings. We can potentially do this for all packages in KB+ (and at package level for any subscriptions not in KB+). So this is helpful in gradually replacing data otherwise stored in our filing cabinets. Workflow 2: Adding and viewing core subscriptions, including cancellation rights. This gives us an historical record of our core subscribed titles for particular years, as when entering core titles we are able to specify if they are Print only, Print+Electronic or Electronic. The workflow also ensures that entitlements around core individual journal subscriptions, on which “big deals” are based, are not lost in the noise of the generic entitlements for the big deal package. This functionality also makes it easy to review our list of core titles annually to claim any cancellation entitlements that may be part of the current “big deal” package agreement. Workflow 3: Checking past entitlements. The Title List functionality includes backfile and frontfile subscriptions, so we can search and drill down for details about individual titles we have subscribed to in the past (making sure we have left the ‘Subscriptions valid on’ blank so as to select ‘all years’). Then we can use the ‘Full Issue Entitlement’ details to view data about any potentially missing past entitlements. Workflow 4: Using the Titles functionality and data to populate our link resolver. From the Titles option, we can select packages and our local entitlements data using the filters and can then get a.csv export. 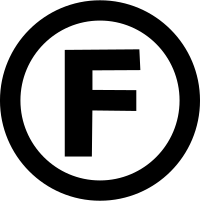 The format needs manual editing to be in the correct format for our link resolver upload (we understand this functionality is being worked on by the KB+ team to become more automated). Workflow 5: Add Licenses that apply to our subscriptions and view/amend the summary data. These are simple to select and present helpful summary data about what is, and is not, permitted, under our current licenses, e.g. Walk-In Users, Course Packs, Interlending, concurrent users, remote access, post-cancellation access, partner, alumni, SME and multi-site access. We can also manually edit these summary data to take into account our local circumstances. Workflow 6: Upload our own institutional local licenses. This is achieved through the ‘Add Documents’ functionality. This functionality is helpful if there is no generic license available from KB+ or if one of our local licenses has substantial differences from a generic one. Workflow 7: Identifying possible overlapping subscriptions. 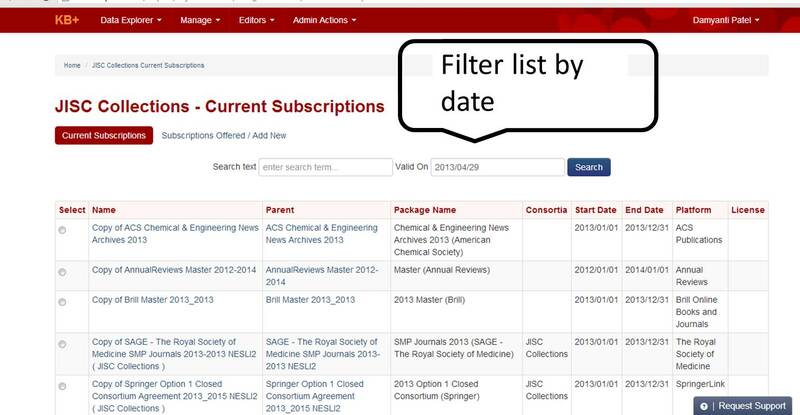 Filtering a Title List to the current year’s subscriptions, we can search and drill down for details about individual titles (the ‘Full Issue Entitlements’ screen) and note if the same content is being delivered through several packages and potentially cancel a title (or even package) if the duplication is unnecessary. Workflow 8: Identifying alternative packages that might include this title. Filtering a Title List to our current year’s packages, we can search and drill down for details about individual titles and note if the same content is available through several packages and potentially choose a different, possibly cheaper, one. Workflow 9: The annual renewal process. Accessed from the ‘Manage – Generate renewals’ spreadsheet option which shows us all possible subscriptions, not just our own, and allows us to compare this year’s with next year’s packages, for example. We can see which titles have been dropped for 2014 but also any added as well. Workflow 10: Dashboard and alerts. The alerts functionality enables cross-institutional knowledge-sharing about known problems and issues and appears on our dashboard. We can comment on any alerts to add further support to the issues that have been shared. There are also alerts for changes to generic licenses. This functionality allows us to add local Notes to our subscriptions and licenses in case there are particular known issues or points to remember (e.g. renewal dates). Copyright free. This content can be edited, redistributed and reused without attribution. I have been looking forward to release 2.1 of KB+ as it includes improvements to the way we upload data and greater flexibility in terms of editing the information once it is in the system. 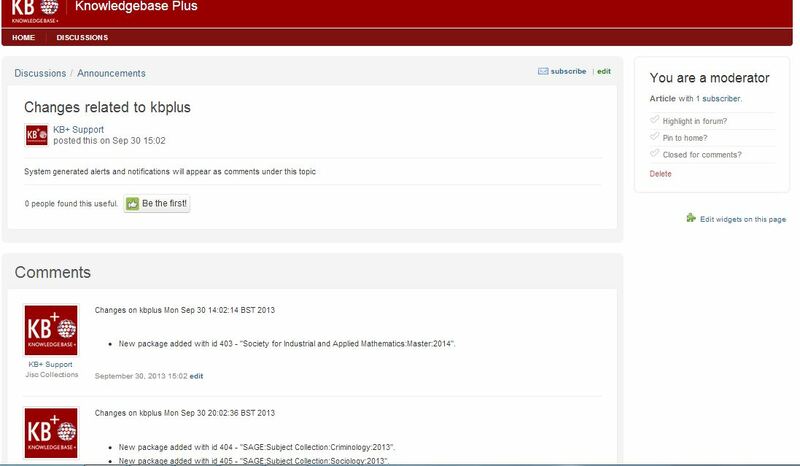 The new upload feature provides greater efficiency in automating some basic data formatting greater flexibility in terms of adding different types of data including ebooks and greater feedback on any issues found with the data allowing us to troubleshoot more effectively. There are now more opportunities to edit information which is useful especially for those packages where titles are continually added, for changes to start dates etc. 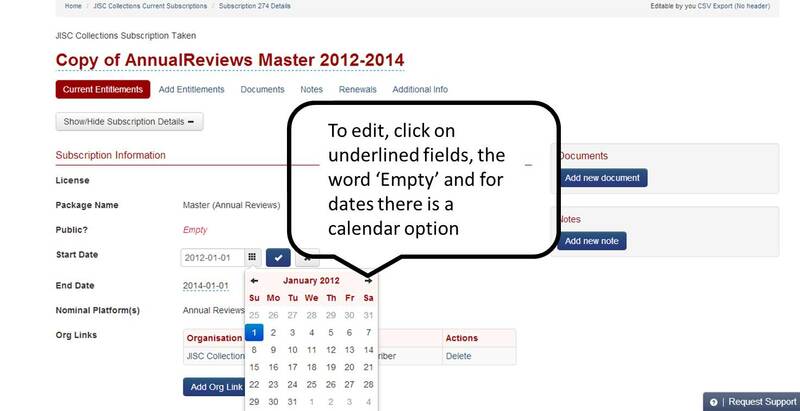 Editable fields now appear as underlined with a dotted line and simply click to edit. Editable fields with no data appear with the label ‘Empty’ simply click on the work ‘Empty’ to edit, you will be prompted to save save/cancel changes by clicking on the tick or cross icon. You can edit “Date fields” by choosing a date from a calendar, or by typing a date directly in YYYY-MM-DD format. Clicking the ‘Month and Year’ twice on the calendar also allows you to change years easily. Lists of Subscriptions can be filtered by date. The current default now displays subscription that are ‘valid’ today. If you want to see Subscriptions valid in the past or future simply type in a date using the format YYYY/MM/DD. This date filter can also be combined with the existing keyword search option. I think this improves the usability of the system in ensuring you can see the most relevant data. 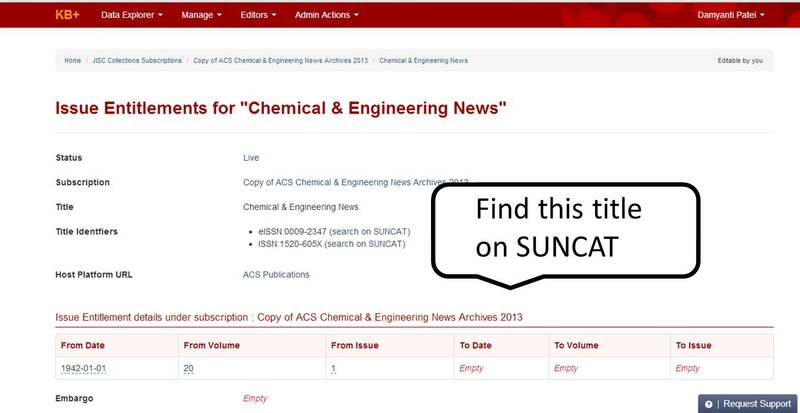 You can check other journal details such as change of titles etc from a link to the SUNCAT records for that title. Documentation will be updated to reflect these changes shortly and as always we welcome you feedback on these new changes.